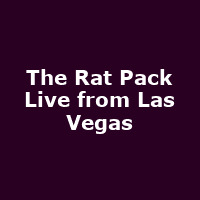 £10 tickets for The Rat Pack Live from Las Vegas/ Xmas until 2nd Jan 2010! Touring since 2000, The Rat Pack's current run at the Adelphi started last month, with 'The Rat Pack Live from Las Vegas' giving a glitzy Frank Sinatra, Sammy Davis Jr. & Dean Martin show. The Rat Pack have now been in the West End for four years, and their 'Christmas with the Rat Pack' show, which starts on 24th November will mark the start of their fifth. The Live from Las Vegas show transports you back in time to the Sands hotel era, where Frank, Dean and Sammy earned the name "The Rat Pack", featuring songs such as; 'The Lady is a Tramp', 'Mr Bojangles', 'I've Got You Under My Skin', 'That's Amore', 'New York, New York', 'Fly Me to the Moon', 'Me And My Shadow', 'My Way' and many more. We are able to offer you Upper Circle seats for just £10 (usually £30) or the best available seats for less than half price: £19.50 (usually £49.50) for either the 'The Rat Pack Live from Las Vegas' or 'Christmas with the Rat Pack' offer. The offers are for Monday to Thursday performances only, running until the shows' Adelphi runs come to an end (21st November for Vegas and 2nd January for the Christmas show). Check the 'Rat Pack Vegas' or 'Rat Pack Xmas' buttons for availability.